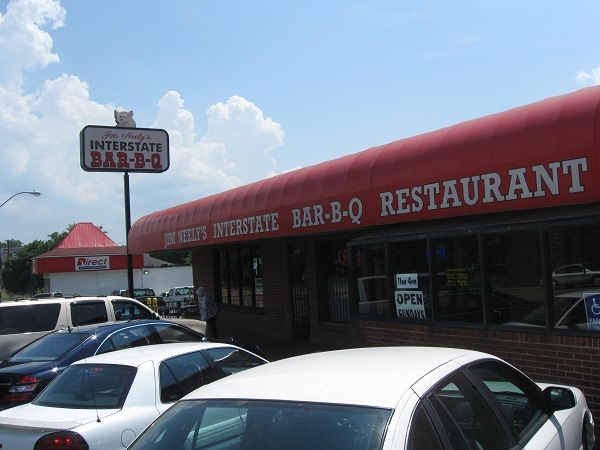 Interstate Bar-B-Q, Memphis TN – Marie, Let's Eat! I’ll tell you the number one, guaranteed best way to start a good-natured argument: get into it with somebody local about where the best barbecue in Memphis might be found. Folk here take their pork seriously. The locals eat a whole mess of it, with a thick, sweet sauce and lots of slaw. The strangest thing about this trip, in retrospect, was that we were in a city world-renowned for its barbecue for a good twenty-four hours before we actually had any. Marie, who mostly arranged our meal itinerary this weekend, did this before, when we went to coastal Georgia and didn’t have any seafood. I love my wife, but sometimes she misses the forest for the trees. Fortunately, while Marie might be a touch myopic about such vitally important matters, she’s also the most agreeable person anybody ever met, and was happy to put one of her selections aside so we could find some Memphis barbecue for lunch on the Sunday. Her sister suggested a place called The Bar-B-Q Shop on Madison Avenue. This wasn’t difficult to find; there are several instances in Memphis where the streets are laid out in the order of presidents. It doesn’t always work right, but Madison Avenue is actually sort of between Jefferson and Monroe. Unfortunately, it’s also closed on Sundays, like a good third of the businesses in town. Tell you what, the next time we’re in Memphis, not only won’t it be in the middle of a summer heat wave, but it also won’t be on a Sunday. Stymied, we went back to Anne’s house and looked up a place that got good reviews and was open. Jim Neely’s Interstate Bar-B-Q seemed to fit the bill. Sadly, driving there from the midtown neighborhood takes you through some really dilapidated areas of town, but it’s a road plenty of people drive. We got there around two and they were completely packed. Perhaps I was spaced out or overwhelmed by the crowd or the decor, but I didn’t leave with a real feel for the place. It really was a case of sensory overload; there’s just so much going on and it is so loud. Between the World Cup on TV and the constant thudding of cleavers hitting counters in the kitchen, this place was as noisy and frenetic as a college town bar on a Friday night. Nevertheless, between the three of us, we certainly ate extremely well. I am looking forward to going back to Cafe Eclectic one day and trying for a better meal, but while that was my favorite restaurant of the five sampled in Memphis, my lunch at Interstate was hands down the best meal. 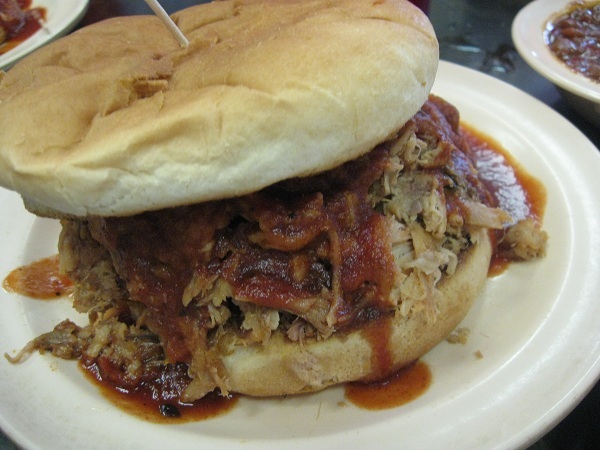 I had a pork sandwich without slaw – the only gap in the constant barrage of noise was the sudden gasp and beat of silence from the whole room when I asked my server to hold the slaw – along with a side of beans and a small plate of Mr. Neely’s famous barbecued spaghetti. Now this stuff really is interesting. It’s chopped pork over spaghetti noodles with a sauce that mixes the thick sweet stuff served on sandwiches with a thinner, red spicy sauce. It was piping hot and incredibly wonderful. My tongue enjoyed the nicest burn it’s had in weeks. I’d never had anything quite like it before, but, again, reputation and legend beat me to the punch. When we got back to Georgia, I told Neal about it and he said that he saw Jim Neely a time or two on Paula Deen’s show talking about it. One of these days, I hope to find something new to eat that Neal didn’t already see on the Paula Deen show. We all liked this thick sauce a lot. Marie says that the only thing wrong with it was that there wasn’t any on the table to put into the center of her sandwich. Although the outsides of the filling were pretty well drenched, the bread was inadequate to the task of containing the sandwich for eating out of hand, and once she gave up and started using a fork, there was just so much meat put into it there was a significant amount of pork that didn’t have any coating. I think the server might have brought us some more if anybody had a chance to ask above the din. It is perhaps a shame to lose the welcoming feeling that I’m certain Interstate must have had in its earlier days, but perhaps that’s the price of such wild success. This food is completely wonderful, and while I’d have preferred a slower pace and a little more attention, I understand how these things happen. When a place gets this big on the strength of its excellent food, spirited owner and a roaring word of mouth, it’s understandable that the personal touch starts to slip away. The really crazy thing, though, is that I hear talk that there are at least two barbecue joints in town that are even better. Of course, the talk came from people who were about ready to come to blows over the matter, but at least they were good-natured blows. Posted on June 25, 2010 July 29, 2017 by Grant G.Posted in barbecue, memphis, roadfood, tennesseeTagged barbecue, memphis, roadfood.com, tennessee.